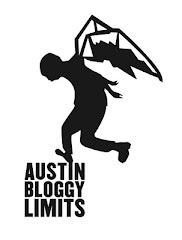 You may, or may not have noticed that AustinBloggyLimits has been short on updates the last two weeks. Well there are several reasons for that. First and foremost being hey it looks different now. I thought the old look was a bit dark so I went with this weird banana pudding look. You like? Man, I have so many things to tell y'all so this isn't going to be a typical AustinBloggyLimits post. I'm going to be a bit scatter-brained trying to relay two weeks worth of somewhat interesting stories. Part of me wants to split these stories across a few posts but instead I'm just going to quickly vomit out some highlights of my music life in the past two weeks. Ok, I'm going to start with the sold-out Animal Collective show at Stubb's. I really wanted to go but didn't have tickets and refused to pay the outrageous scalper prices. At the last minute my Twitter tweeps hooked it up. Austin Kleon offered me a set of tickets "Radiohead Model" pay what you want. I ended up taking 1 ticket for $20 and giving Austin a ride to the show, but for the record he would have flat-out given me 2 tickets so, take that scalper d-bags! As far as the show itself? I was entertained and inspired/intrigued by Animal Collective. They are doing something completely different with music. The show was more like performance art than a straight-up concert. Was it totally entertaining/engaging the whole time? No. Was it worth the $20? Hell yes! My personal highlight was hearing Lion in a Coma I like that song so much more now. I think Summertime Clothes got the biggest response from the crowd though. The week after AC was somewhat uneventful other than dealing with day to day non-music bull and trying to straighten out/gay-up my site. Then THIS week I saw Grizzly Bear crossing the street in front of my car, later that night I saw them perform at the Parish Room. Here We Go Magic was the opening band and they did an excellent job. For me the job of an opening band is to play a 30-45 minute set, in which time you should remind us the name of your band and latest album at least twice. This may seem awkward but a lot of people are showing up throughout the opening slot so.. self-promote opening bands! The other key factor for a "good opener" is that their music is similar or complimentary to the headlining band. Here We Go Magic covered all of these bases. They also saved their most-well-known songs for the end of the set. There is nothing worse than an opener that starts with their hit and then makes you listen to 40 more minutes of songs you don't know. Grizzly Bear was outstanding/beautiful/powerful. When I listen to the albums it's easy to get caught up in the most obvious elements, the singing/songwriting. In person though I was totally engrossed in the rhythm parts. Grizzly Bear has some amazingly thoughtful, soulful, powerful drum parts in their songs. It's like Sigur Ros where it's less about precision and more about mood, tone, feeling. Personal highlight for that show was hearing the, "Chin up, cheer up" crescendo/explosion from the song Lullaby, that was a transcendental moment for me. Oh yeah, and the sound at the Parish can only be out done by the sound at the next venue I went to. Last night I had the pleasure of attending my first live taping of Austin City Limits the TV show. Before I moved to Austin ACL was pretty much all any of my friends/family knew about Austin so it was quite moving to be on the set in real life. It is a lot smaller than I imagined it to be, and they give out free beer. Not enough to get drunk but enough to taste beer you didn't pay for. Austin locals Okkervil River performed in the KLRU studios and they played a career-spanning set. Touching upon songs from all of their albums from the last 8ish years. The crowd was very reverent, hanging on every note and leaving a space of silence before erupting into applause after each song. In the above video AC Newman is singing Will Sheff's part. Okkervil played this twice for the ACL taping. Oh the magic of television. The sound on the Austin City Limits stage is impeccable. I promise you I have never attended a live performance with better sound in my life! I was worried because I forgot my earplugs but they were not needed. I could understand every word that was sung, I heard every bass note clearly and every pluck of every stringed instrument was full and rich. I was so used to muddy bass tones and washed out vocals I sort of forgot what a live performance SHOULD sound like. You hear that downtown?!?! Louder doesn't mean better, and when the bass is so loud it effs up my breathing I'm not entertained. The other super-pleasant thing about the ACL taping was the air conditioning. I haven't been to a concert that was so temperate since I lived in New England. Get it? They played Lost Coastlines twice so I posted it twice. The truly crazy thing about the ACL taping is I have tried to get into that show for three years and somehow this week I'm going twice. Like that old expression says, "When it rains, it pours." Oh, and for those who don't know, that other guy singing on Lost Coastlines is the lead singer of Shearwater and he used to be in Okkervil River but now he is just a "guest" and he performed at the taping too. So, that's what I've been up to. I wonder if anyone will read this I haven't updated in so long y'all probably gave up on me. I'm back though, so come and see me and tell your friend(s) too. Before I sign off I forgot to mention, I had a spare ticket to see Grizzly Bear and ended up selling it to, Toto, the drummer from the Octopus Project. How Austin is that? Oh and when I was at the Animal Collective show I was standing amongst members of Harlem and Electric Touch. It was such a "scene" environment complete with dude-bras and uber-hipsters who just show up to chat and make fun of people/places/things/nouns. Speaking of chatting, if you happen to have the chance to see Grizzly Bear in concert do you think you could shut the eff up while they're performing? That was so annoying I wanted to collectively slap people. I don't get spending money to try and talk OVER a band? There's like 1.3billion bars in Austin pick one without an amazing band if you feel like getting your chat on. Oh, and could the dude-bras lay off the Axe body spray PULEASE!?! ?